Impossible Rhubarb Cake or Good But Fattening! Prepare cake mix batter according to directions on box. Pour into greased 9×13 baking pan. Sprinkle with rhubarb and sugar. Slowly pour cream over top. Bake at 350 for 40 -45 minutes or until golden brown. Cool for 15 minutes before serving. Top with whipped cream. Refrigerate leftovers. Makes 12 -15 servings. A recipe that has been in my family for years is Rhubarb John. It came over on the boat with my family from Sweden in the late 1800s. I have never had any dessert from anyone else or have seen a simular recipe in a book like this one. It is relatively plain but is very good and straight forward. 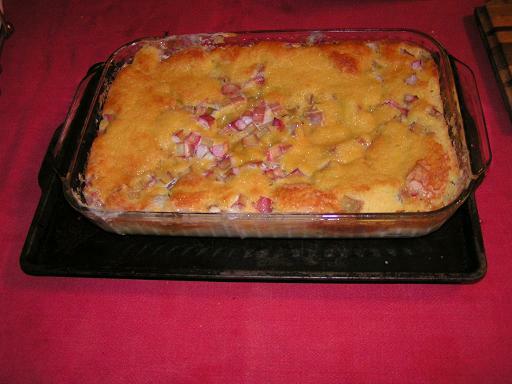 Mix dough and place on top of rhubarb. Bake in a 350 degrees oven for about 35 minutes. Crust should be golden and rhubarb tender. Serve in a bowl with half/half sprinkled on the top. Whipped cream can also be used. Best served warm. We always several patches of rhubarb scattered about the farm. Mom canned it and we put it on shelves in the basement. Mom made pies, “rhubarb crisp,” and several cake-like concoctions. All were delicious, even when “tart” because Mom skimped on the sugar. Dad led me to believe that rhubarb had medicinal properties. After all these many many years, most of what he taught me and prophesied has been spot on… I’m glad more people are enjoying this treat. I appreciate your posting. It brings back memories.